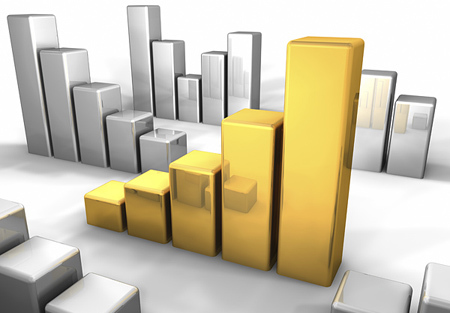 (Kitco News) - Commerzbank looks for most precious metals to strengthen in 2019, with the exception of high-flying palladium, which the German bank says may be due for a correction lower. "Precious metals prices are likely to rise next year, chiefly on the back of a weaker U.S. dollar as the Fed rate-hike cycle comes to an end,” the bank said in an outlook report released Wednesday. Commerzbank forecasts gold will average $1,250 an ounce in the first two quarters of 2019, but then rise to $1,300 in the third quarter. "We expect the gold price to increase to $1,350 per troy ounce by the end of 2019,” the bank said. Silver was called to "perform comparably to gold,” although not necessarily outpacing the metal, as often happens in bull markets. Silver was forecast to average $14.50 in the first quarter, $15 in the second and $15.50 in the third. 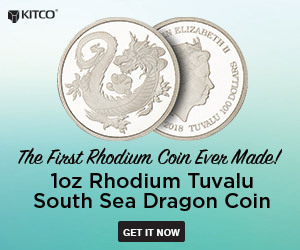 "We expect the silver price to rise to $16 per troy ounce by the end of 2019, though this would still leave the gold/silver ratio at a high 84,” the bank said. The ratio measures how many ounces of silver it takes to buy an ounce of gold. Platinum is seen rising from $800 in the first quarter to $900 by year-end. Commerzbank sees palladium falling back as far as $1,000 before bouncing back to around $1,100 by the end of 2019. After starting 2018 strong, gold went into a several-month slide, which Commerzbank blamed on a strengthening U.S. dollar on the back of rising U.S. interest rates, as well as record highs in the stock market. Weakness in emerging-market currencies hurt demand in key gold-consuming nations as the precious metal became more expensive in local currencies. Gold has stabilized in the last couple of months, however, and ticked up from the lows for the year. Gold also could get a boost from short covering as traders buy to exit from short, or bearish, positions, the bank said. Money managers are currently net short. Commerzbank pointed out that the platinum market is expected to remain in an annual supply/demand surplus this year. Like sister metal palladium, the main industrial use of platinum is for automotive catalytic converters. Palladium, however, has been in a supply/demand deficit for several years, enabling prices to hit record highs in December while platinum languished. However, Commerzbank said palladium is likely due for a pullback. Commerzbank said palladium demand from the automotive industry may have hit a "plateau” for now, with the trade war between the U.S. and China is already hurting auto sales in China. Further, the price rise may have resulted in "speculative exaggeration,” Commerzbank said. Speculators could drive prices still higher. Prices are likely to drop to $1,000 by mid-2019, the bank said, although stricter emissions standards should help demand for palladium even if car sales are stagnant. Still, an eventual substitution of platinum for palladium may slow palladium demand. "After correcting, the palladium price should resume its upswing; we forecast a price of $1,100 per troy ounce by the end of 2019,” Commerzbank said.